What Are Pottery and Ceramics? What are pottery and ceramics? Is there a difference? Is everything that is made out of clay pottery? Are all ceramics made out of clay? Pottery and ceramics have been an important part of human culture for thousands of years. From prehistoric storage jars to tiles on the space shuttles, pottery and ceramics have played a key role in innumerable human endeavors. But how do we define them? Technically, ceramics are those things made from materials which are permanently changed when heated. For example, clay has chemically bonded water in it which will cause it to slake down (disintegrate) when a dried clay object is put in water. Once heated (fired) to between 660⁰ and 1470 F (350 and 800 C), the clay is converted to ceramic and will never dissolve again. All clay is a ceramic material, but there are other ceramic materials, as well. Glazes are also ceramic materials because they permanently change during firing. Industrial ceramics include a range of materials such as silica carbide and zirconium oxide. Studio pottery (studio ceramics) can be quite diverse. 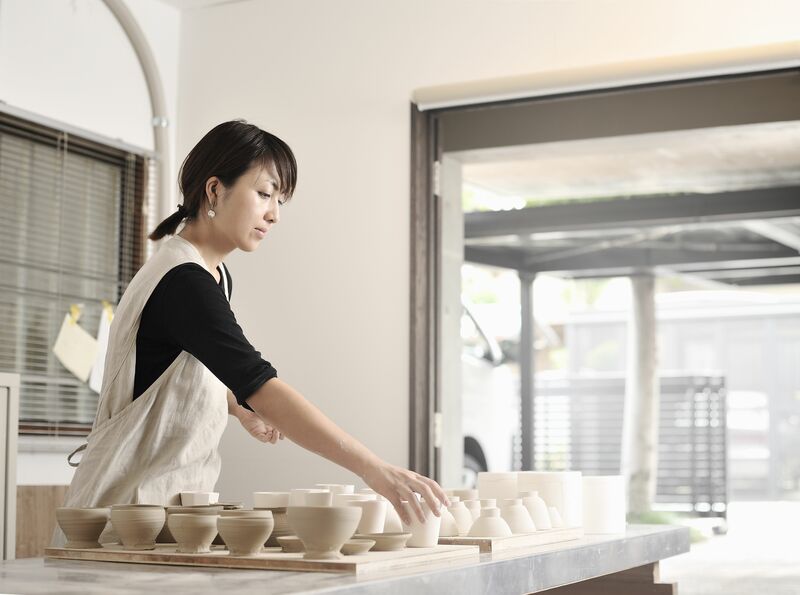 Production potters are most active in making large quantities of ceramic wares such as plates, platters, dishes, bowls, and so on. Production potters can sit down with a hundred pounds of clay and throw the same form all day. The technique of throwing off the mound is often employed by production potters because it reduces time spent centering the clay and moving bats on and off the wheel head. Other studio potters are more concerned with creating forms for their uniqueness and beauty. These "art" pieces might still retain full functionality, or they may move toward being more sculptural. Many of these are "one-off" pieces, meaning they are one-of-a-kind. From prehistoric times to the present, clay has not only been used to create utilitarian items like bowls and storage jars, but also rich works of three-dimensional art. Clay artists such as Peter Holland may work as designers for commercial potteries, they may do sculptural work as part of their studio pottery, or they may work exclusively as sculptors in clay. Potter, Ceramic Artist or What?